Inder Loves Folk Art: Perfect Pattern Parcel #2! By now you've heard all about Perfect Pattern Parcel #2 - it's a package of girls' patterns by independent designers - you decide how much you want to pay and how you want to allocate to the designers and to charity. Pretty sweet. And if you pay more than $24, you get a bonus pattern! Check it out! The pattern selection is awesome. So you can imagine - when Rachael at Imagine Gnats asked me if I'd like to participate in the blog tour for PPP#2, I was like, "um, you don't have to tell me twice! sign me up!" I wish I had time to make all of the patterns and blog a whole wardrobe, but of course I don't. 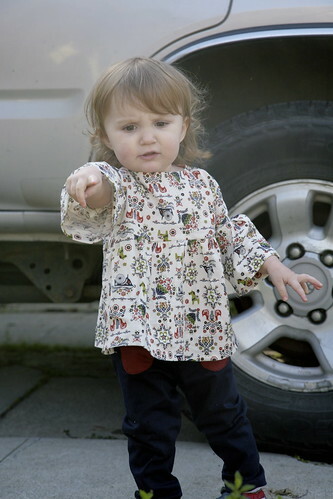 So I started with two easy, fast makes - LouBee's Hosh Pants and Too Sweet's September Tunic. Both of these patterns have been around for a while, and were on my "to-buy" list. Score! The Hosh pants are a simple slim fit pant designed for stretch wovens. I actually ended up making two pairs of these, but the first (size 2T) were too big, so I made up a second pair in the smallest size. They are still a bit baggy on Maggie, and she has room to grow. I added a couple of little red pockets to the front of these, which you can't really see with the tunic on! The September Tunic has an adorable boho vibe - something about the dolman sleeves and little ruffles. For this, I used some very precious Kokko fabric printed with Scandinavian motifs (I would link to a source, but for the life of me, I can't find this stuff on the internet?!). Isn't it absolutely lovely? I practically tripped over myself getting this to the cutting table at Stone Mountain and bought way more than I will ever have any use for. But it's so me! Both of these patterns would be great patterns for a beginner. The September Tunic is bound at the neckline with bias tape - an easy and professional looking finish. My only issue with the pattern is that it is really snug through the upper arms on Maggie. Maggie is small, but her arms are deliciously chubby. So I'm afraid this tunic is not going to last very long in its current form - I will probably lop off the sleeves and make it cap-sleeved for a comfortable summer dress. I really love the little sleeves, though, so I think I will have to make a bigger version as well! It would be easy enough to add a little more room in the sleeves - if you're making this up, I would suggest measuring your child's upper arm before cutting it out. Oh, my baby Margaret Joy! Growing up so fast! Murphy's law of blog photo shoots: The best shot of your kid's whole outfit will be right in front of your old, dirty Toyota 4Runner. It's just inevitable. But here's the only photo where you can see the little pockets on the front of Maggie's Hosh pants. And then your kid will point out something "yucky" that's right in front of where you are kneeling. You'll worry that you might be kneeling in dog poop, but thankfully, it turned out to be just a stick. My kids are great poop-spotters; good to know Maggie has my back! Haha. I hope you are having a wonderful weekend! 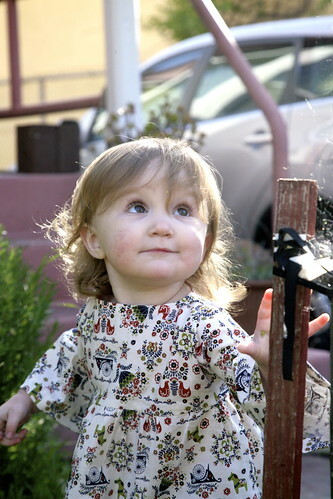 It is a gorgeous day in Oakland, so we are off to the nursery to shop for "baby plants," as Joe calls them. Time to play in the dirt! Oooh, Inder, you and I have a special connection. Because after you said you *knew* I would pick the Caroline Party Dress, I channeled my inner Inder. I really did. And I thought through all of the pattern choices. And I was like - Hosh Pants or September Tunic? Hosh Pants or September Tunic? And I was leaning slightly more toward September Tunic and boo-yah (I never use that word, by the way!) I was right with BOTH! woot! Oh my goodness that is exactly what i was going to say!!! "she is getting to be so big and grown up!!" How? These are both on my list of "to sew" this week as well! I love your versions, so so cute! I know!! It's crazy! She's 21 months (I think? I lose count!) and fully acting like a two year old these days, never wanting to be carried, always wanting to do everything herself, with "no," "mine," and "me me me me!" being her favorite vocabulary! Your September Dress completely blew my mind, Jane. Oh, it's a great outfit. That fabric in the top is just beautiful. I remember drooling over something similar, also by Kokka, maybe the same line but a different color, a few years back. I never bought it because $$$ but I wish I had. $$$$ is right! But I loved it so much I just asked for three yards and handed over my credit card! Sometimes you just have to splurge. That is such a cute little outfit on her! 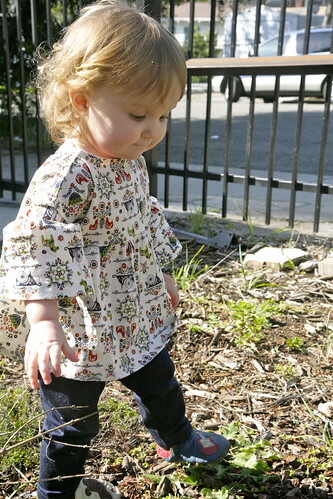 You'll definitely a have to make her a new September tunic if she out grows this one quickly! What a sweet little outfit! 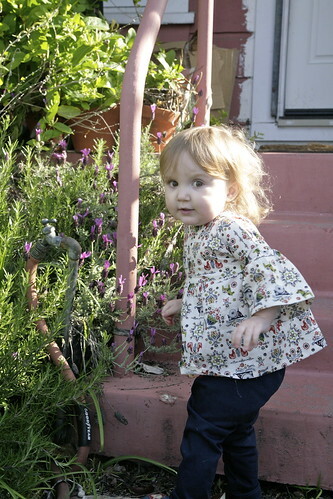 And nice to know that other people's children like to stand in less-than-ideal places just when they're doing their best posing... Hope you had fun getting those baby plants- it sure if nice to have spring arrive! Maggie is the perfect model. So cute! And good to know about the upper sleeves--M is very particular about things like that and she won't wear it if its too tight! 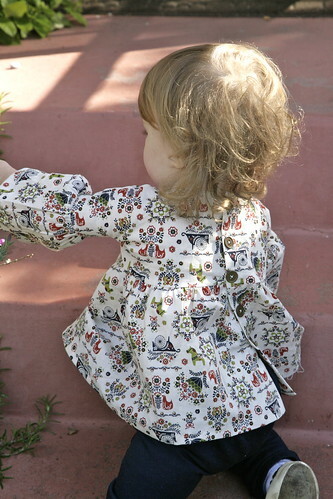 I love the fabric and those pockets are adorable! Ohhh my gosh, so so precious! I love this outfit! Wow! Absolutely adorable in every way! I'm buying the PPP for sure now! Thank you!! It's a great deal - get it while you can!!! 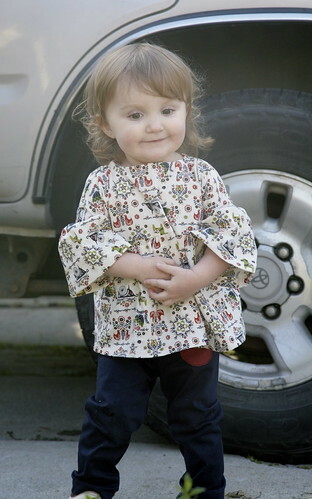 this is just adorable- great fabric choice! Thank you, Erin! I just LOVE that fabric, so I bought like three yards - might have make myself a top!